The Fox Goes Free has long enjoyed a great reputation for pub cuisine, locally sourced delicious real ales and handpicked fine wine. Our rooms have a charming character of their own, each spacious enough for 2 persons to enjoy a relaxing and stress free stay. Our social calendar includes occasional Live music events, Friday night meat raffles, quiz nights, wine tastings and much more! Always a friendly welcome at the Fox! So if you are looking for a listed pub with original features, great friendly atmosphere and effortless charm, all set amidst beautiful countryside, then pay us a visit. 400 years on and we’re still serving great food & ale! The Fox Goes Free, near Goodwood, Chichester is a beautifully kept 400-year-old country pub restaurant and Inn with a well-respected reputation for wonderful home cooked food, real ales, hand-picked fine wines and friendly, genuine hospitality. The Fox Goes Free is set at the foot of Levin Down 1 mile from Goodwood Racecourse in the beautiful South Downs. The proximity of the ‘Fox’ gives excellent nearby access to West Dean Gardens, Goodwood Motor Circuit, The Cathedral City of Chichester, Goodwood Racecourse, Goodwood House & the Weald and Downland open air museum. Head Chef, Lionel Cannati, has travelled extensively over his career. Before joining The Fox Goes Free, his time working in restaurants in Europe, The USA and Canada has helped give him a unique style that our customers now enjoy. Lionel insists on using the best local produce wherever possible and makes everything within the Fox Goes Free kitchen, he is a passionate believer in making all his own sauces and Jus which he does daily. Head chef Lionel believes in using local ingredients where ever possible, with seasonality being a key component to our homemade A’ la Carte menu. 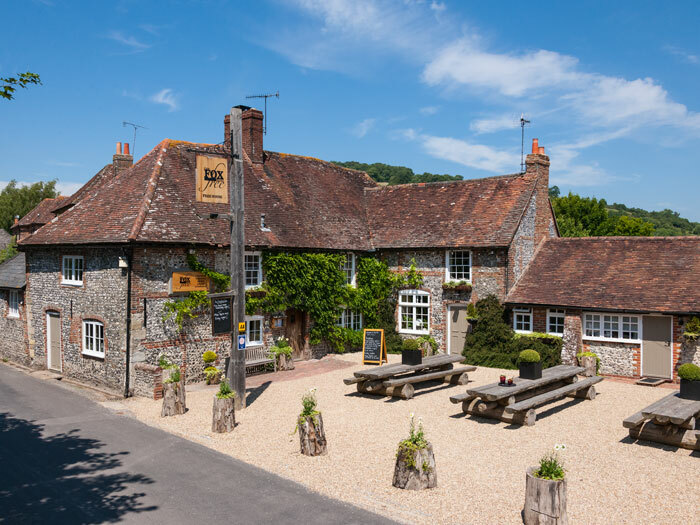 Staying with us at the Fox Goes Free, nestled at the foot of Levin Down, offers you beautiful countryside with peaceful settings within the South Downs of West Sussex. Our traditional bar is stocked with delicious ales, draught lagers, cask ciders, handpicked fine wines and a wide selection of premium spirits. All dogs that are our furry friends are always welcome in our establishment for a special doggy treat and of course a refreshing drink of water! The Fox Goes Free enjoys a rustic charm with inglenook fireplaces and many of the original features of a real pub with a cosy atmosphere. With quiz nights, wine tastings, Friday night meat raffles and charity events there is always something to do and see at the Fox Goes Free! Stay with us in one our bed and breakfast rooms; visit one of the famous events including Festival Speed, Goodwood Horseracing, Qatar Goodwood Festival or Goodwood Revival. Come back to the pub, have a well-deserved pint, a relaxing dinner and know that your bed is near at hand. The wedding venues of Upwaltham Barn and Farbridge are within a few miles. If you are attending a wedding locally why not book a room with us? You know that after a night of celebrations you are only a short taxi drive away from a comfortable welcoming bed and a tasty breakfast the next morning. you want to stay in our accommodations then The Fox Goes Free is what you were looking for.